Ali is about to start on a course of drugs to stimulate her ovaries to produce fertile eggs so that she and husband Pete might be able to have their first baby. The couple first started trying to conceive three years ago, with no success. “After about two years, we decided we had better find out if there was some reason, but we really didn’t expect there to be any. My periods have always been a bit irregular, we were both working quite hard and Pete had been away with work in Europe for weeks at a time during the previous year. The fact that I wasn’t getting pregnant could easily have been due to lack of opportunity,” laughs Ali. This condition is fairly common, and occurs with symptoms in around 5% of women. 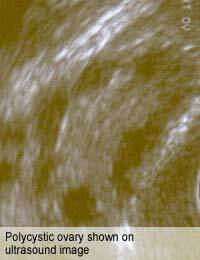 It is found in ultrasound examinations in many more women – about 25% of the female population – but does not cause any symptoms or signs in the majority. One of the problems it is associated with is infertility, because the ovaries produce lots of immature egg cysts, none of which mature. As a result, the periods can be very irregular, sometimes with only one or two each year, and when the come, then tend to be very heavy. “My periods had always been difficult but I didn’t think they were unusual. I would have one about every 6 or 7 weeks, then maybe go three months, and they were quite heavy. Now that I am aware of the full list of symptoms, I realise that I had them all but didn’t recognise them at the time,” says Ali. The other symptoms arise because of hormonal disturbances – particularly the increased amounts of male hormones that circulate in the blood of someone with PCOS. These include overgrowth of body hair on the face, arms, lower legs and stomach, acne, a tendency to put on weight and recurrent miscarriage. “Having acne was common enough and I thought my body hair was just coarse because I was dark-haired and am someone who doesn’t have trouble with their weight!” laughs Ali, the sense of humour shining through again. As well as being advised to lose weight, Ali was also given a choice of surgery or drug treatment to stimulate her ovaries to produce mature eggs. “I opted for the drugs and will be taking clomifene starting from next month in the hope that I will become pregnant within the next few months. For the time being, I am not going to take any other drugs, although I might take metformin when I have stopped breastfeeding as this reduces the impact of the extra androgens my body produces,” explains Ali.